One of the chapters in my LEGO Collectors Guide deals with only parts that were only sold in specific countries. This started out back in the 1950s with parts only being sold in Denmark... and some parts were only sold in Norway, others only in Sweden.. and then others only in Denmark, Norway, Sweden. Later came parts only sold in Germany, some only sold in Netherlands, others only in Italy... and (strange as it is) others only sold in Italy and Japan. Then you can add parts only sold in continental Europe, only in Britain/Ireland/Australia, others only in USA/Canada or only USA or only Canada... and finally only Japan. Today this scenario is repeated in other countries around the world. 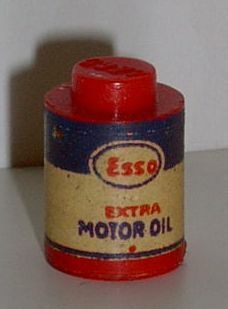 One of the earliest country specific bricks were these 1x1 round Esso Oil Drum bricks (with smooth base) that date to 1955-56 from Denmark. 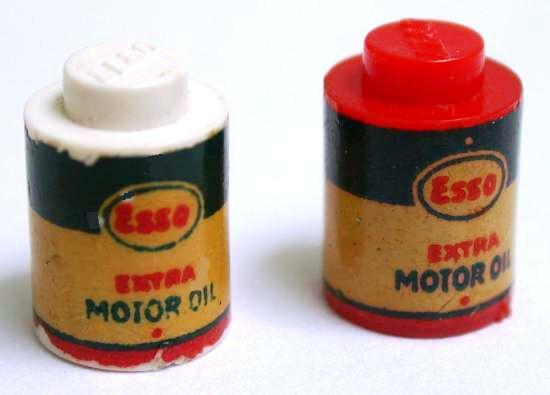 These were only found in the Esso Accessories Spare Parts Pack 1247 (also sold in Norway and Sweden, but without these Esso Oil Drum bricks). 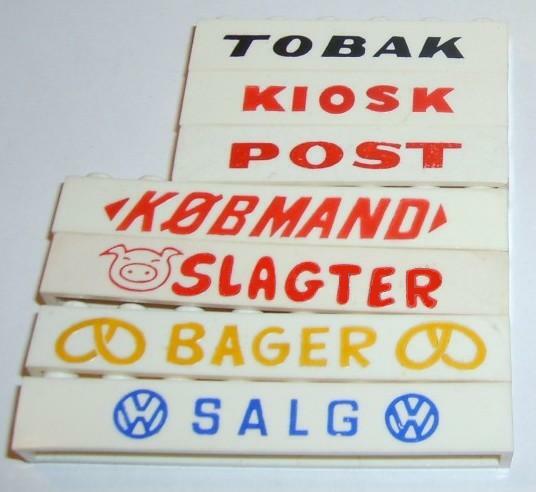 These very rare bricks had an Esso sticker on the brick, and were also found in the 1251 Esso Barrel Truck (1:87 Bedford truck series) of Denmark only. There were 3 of this oil drum bricks in each set, and they were either red or white bricks... with 3 sticker types... with either black, navy or gold background color to the sticker. These very rare Denmark only stickered items are worth about $80-$150 each... depending on the color (gold is rarer, as is a white oil drum) and condition. I wonder if such things would / could go on these days, now the internet makes it so easy to trade worldwide. Was the "Year of the Snake" round door ever sold outside of China / Far East? I picked up a couple on replacement parts. It seems weird to restrict it in sets, then sell it online by itself to customers worldwide. Thanks for the info... I had not heard that that door was available online... I knew that it was sold in China, and elsewhere in Asia that celebrated the Chinese New Year. 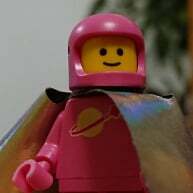 I see there are a few of these for sale on Bricklink. Here's a UK/Ireland/Australia only item.... a 1965-66 4x8 curved plate (as found in the 310 Esso Service Stations)... but with the notches of plastic missing. These plates for all other countries had no missing plastic... so they could NOT attach to a baseplate. But in 1965 they created a new version with the notches... only released in these countries. Here is a prototype blue curved 4x8 plate showing these notches. The irony is that these notches are standard on all curved or off angle plates today... but they were a novelty back in 1965. And speaking of plates... USA Samsonite LEGO had a few sets that had the waffle bottom plates in 4x8 in red, black and gray (1970-71). Not sold in other countries. 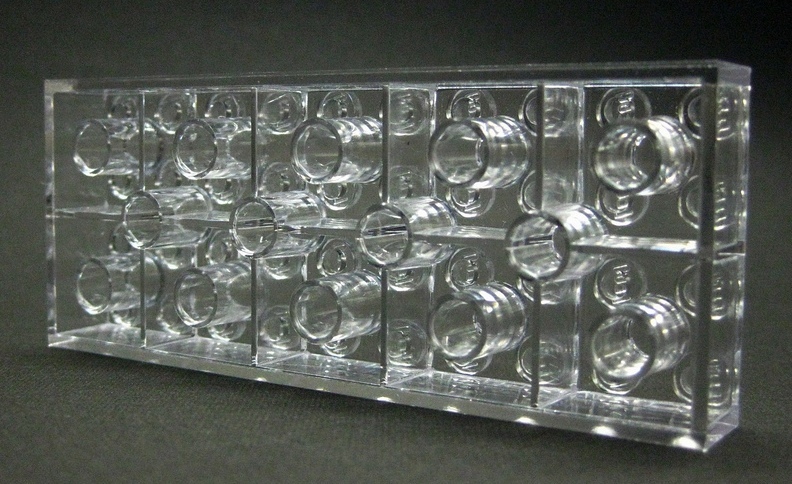 One of my all time favorite parts are those 2x8 and 2x10 trans-clear bricks... only ever found in the USA Samsonite 045 Clear Bricks Parts Pack of 1969-71. There was only 1 clear 2x8 and 2x10 brick in this set. 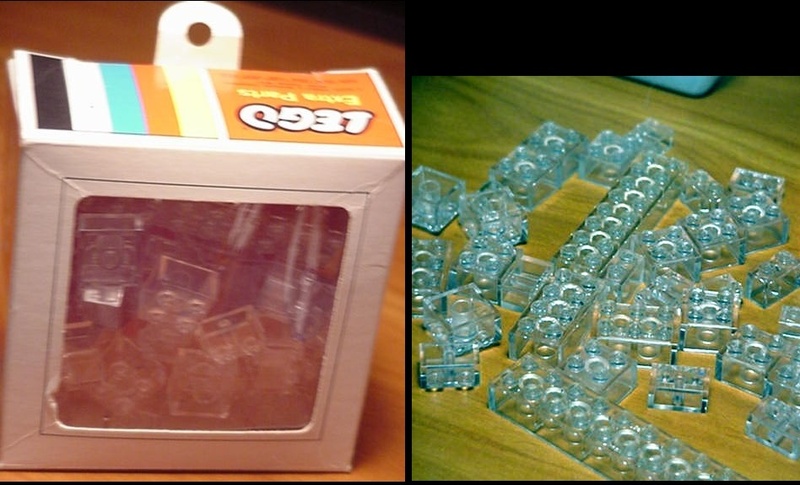 I also once found 3 2x10 trans-clear bricks in a USA 536 Designer Set of that era. It appears that excess inventory was put into other sets of that era. 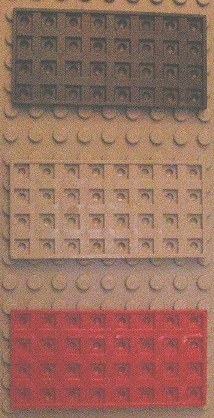 Another interesting piece was the 4x4 corner brick piece, sold until 1972 in all countries in red, white, blue and yellow. In 1963 it was introduced in black in Samsonite USA and Canada in the 217 Spare Parts Pack.. but sold nowhere else in that color in the world. Very interesting. This would make a great front page article or series of articles. 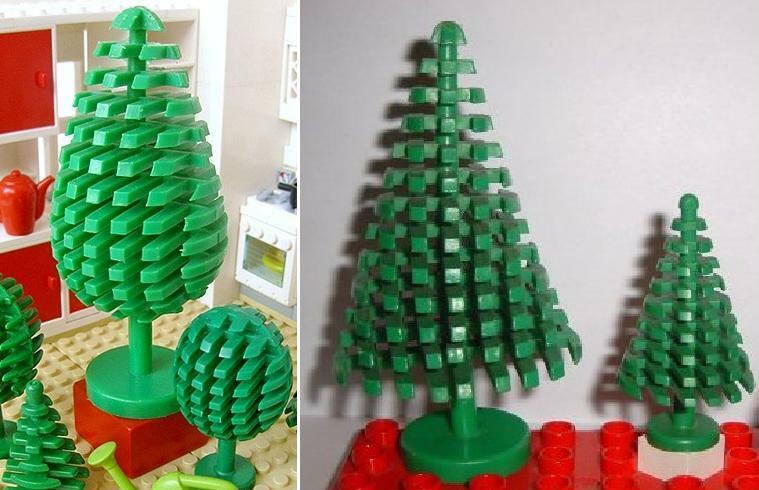 Someone mentioned that the Duplo trees could only attach to Duplo bricks... BUT.... they also attach to a ring of 4 macaroni bricks! 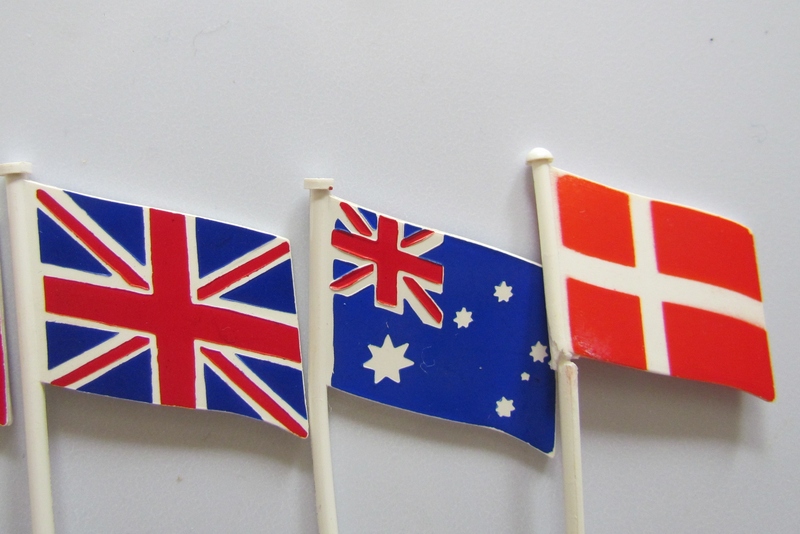 Then entire discussion about the Norway/Sweden early years (Svein Strømberg & Co. of Oslo, Geas Konstharts of Gislaved Sweden, and A/B Lundby of Lerum Sweden) are documented ad nauseum in my collectors guide "Chapter 73 LEGO Sales by Country". 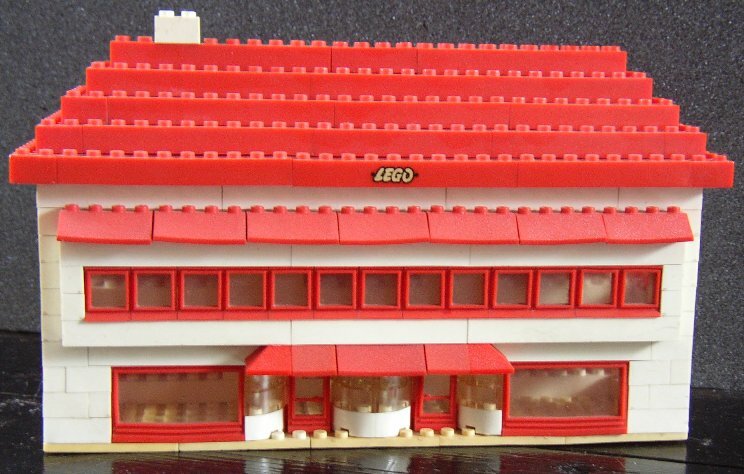 The folks at the Billund LEGO Collections sent me this image... of a Swedish 700/3 basic LEGO set that they had purchased at auction in order to get those very rare yellow early classic windows. They didn't have a set of these in the Billund Collection. But they asked me if the road signs with blue bases were really LEGO (from Norway). I replied... "no those are road signs from a German HO train system. Cool stuff Gary, keep it coming. I've got a few of these that you've mentioned. 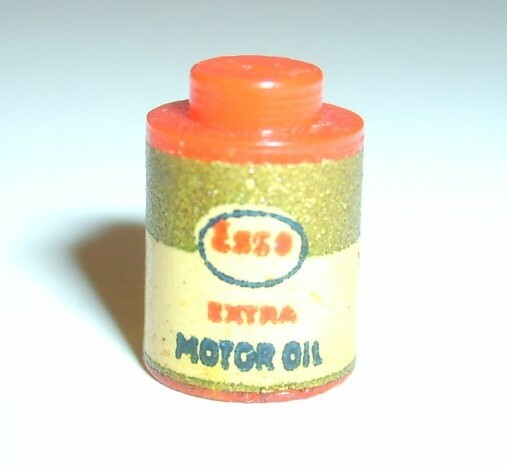 I've a red Esso oil can that I've quite proud of. I have a few gray waffle bottoms I've picked up over the years, but no red or black ones. Two years ago I picked up some early classic windows in blue. 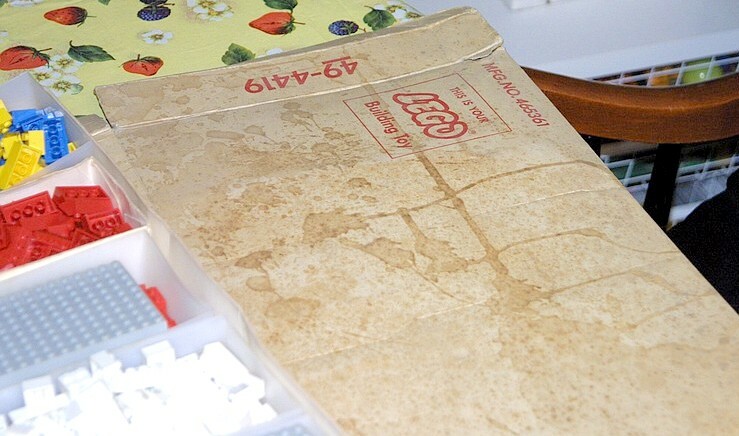 And a few years before that I found 3 2x10 clear bricks in a 536 Designer Set. I've never been completely sure whether those went with that set or not. It sounds like they do. I've tried to pick up a Samsonite road plate, but people are normally asking too much for these. I thought I had a black 4x4 L brick. But I'm finding it, so I must not. Wow, thanks for that info LusiferSam... looks like we both had similar 536 Designer set packing variations. 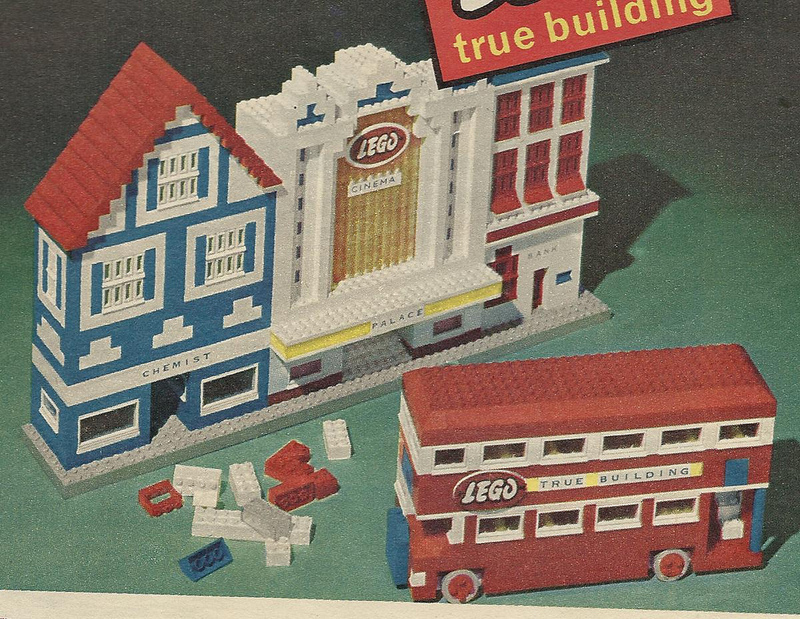 One of the least known of all LEGO sets were the USA/Canada Department Store Catalog exclusive sets. These Samsonite LEGO exclusive sets were mostly found in Sears and J.C. Penney Department Stores, and upmarket FAO Schwarz Toy Store, which all had sets that Samsonite LEGO made just for them. 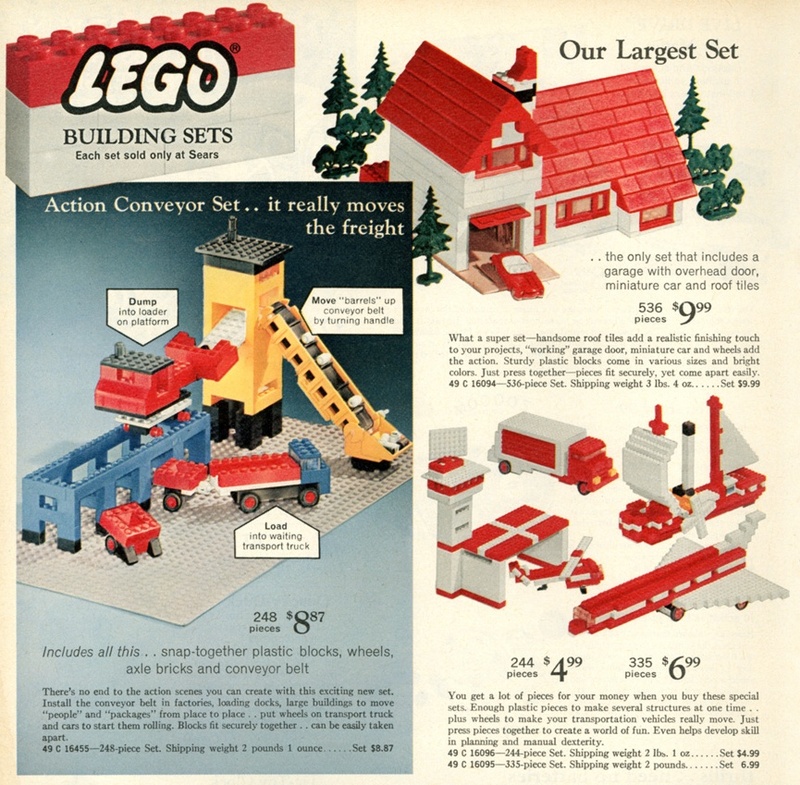 These Department Store catalog sets came in one of 2 varieties... 1) in store sale sets that came in normal colorful boxes... and 2) mail ordered sets that were shipped in a brown cardboard box that seconded as the outer box to the LEGO set. Since FAO Schwarz was an exclusive toy store, ALL of their exclusive sets came with colorful boxes. Here are examples of the 536 box in the colorful box version, and the mail-order version. The 536 set also appears to have had 2 model versions... an earlier one with a small LEGO garage (clear plastic box) with a LEGO 1:87 car. 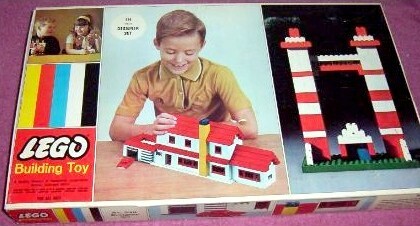 The 1969 catalog image of the 536 model shows this. At some point Samsonite USA ran out of the 1:87 vehicles (which were retired in Europe back in 1967). So with the car and its' garage no longer in production, Samsonite switched over the larger (235 set type) flip-up garage w/ door. Also changing was the elimination of the LEGO 1:87 car, and replacing it with a British MINIX model car... a rare occurrence of a non-LEGO product being used in a LEGO set. 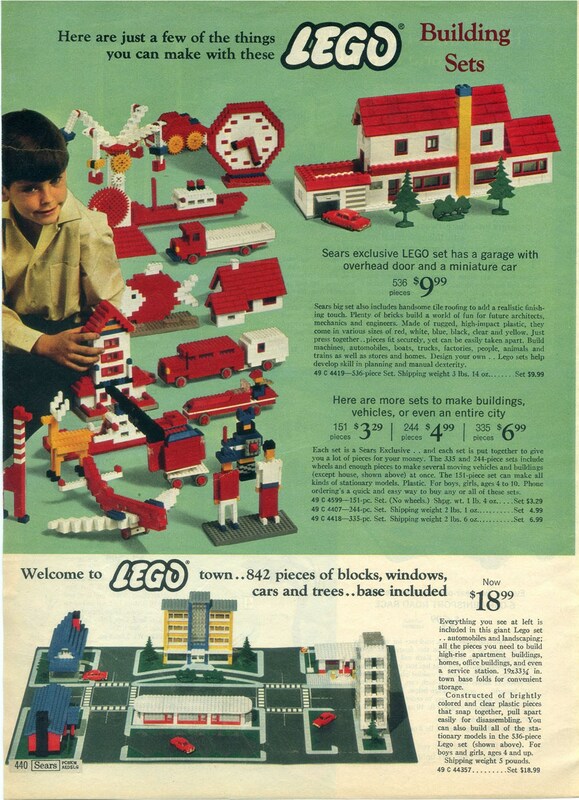 Although the 1971 catalog image shows the different garage (the box never changed the artwork), this set version should also have the Minix car. 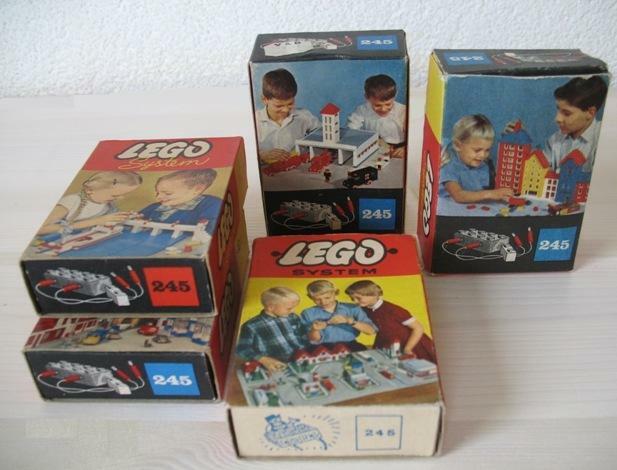 The 15 years (1961-1975) that USA and Canada Department Store exclusive sales were sold, this produced a very unusual and varied series of sets that were not sold anywhere else in the world! My LEGO Collectors Guide - Chapter 12 - USA/Canada Department Store Exclusive Sets, is an extensive look at all of these collectible sets, their images, and the catalogs that showed them. 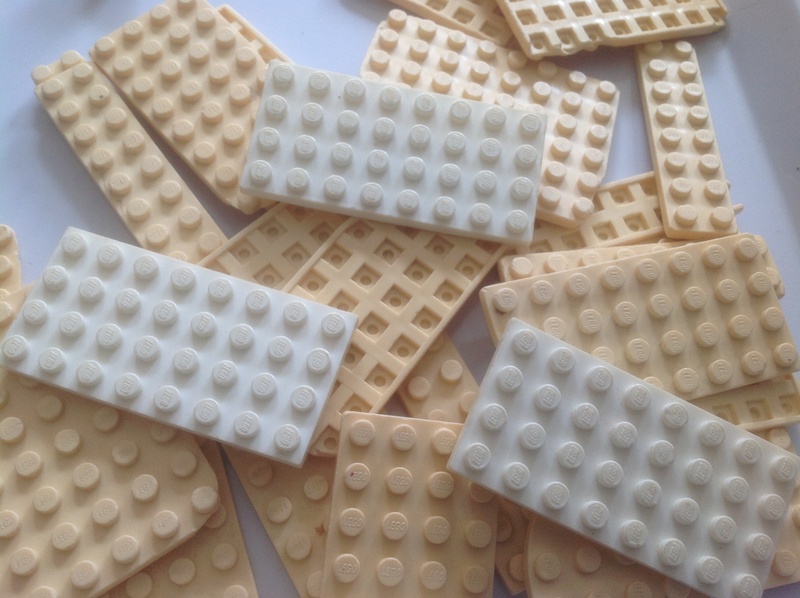 Can you tell me anything about these "waffle plates" that was in my Aunts lego? They are a strange buttery yellow and unlike the rest of the lego, they are in rather battered and broken condition. Maybe, but compared to my aunts ordinary white plates, they are very different, and they are all very uniform colour! 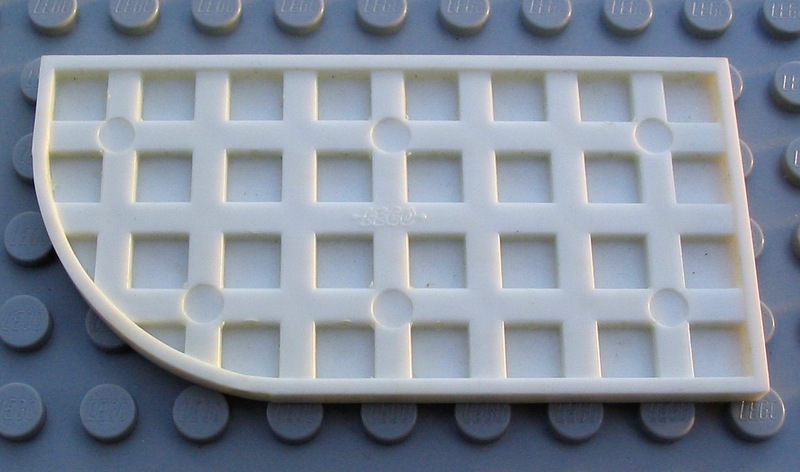 I talk about these "waffle bottom" plates (ad nauseum) in my collectors guide Chapter 50 - LEGO Waffle and Circle Bottom Plates. These plates date to 1956-63 in Europe, and 1961-71 in the USA/Canada. 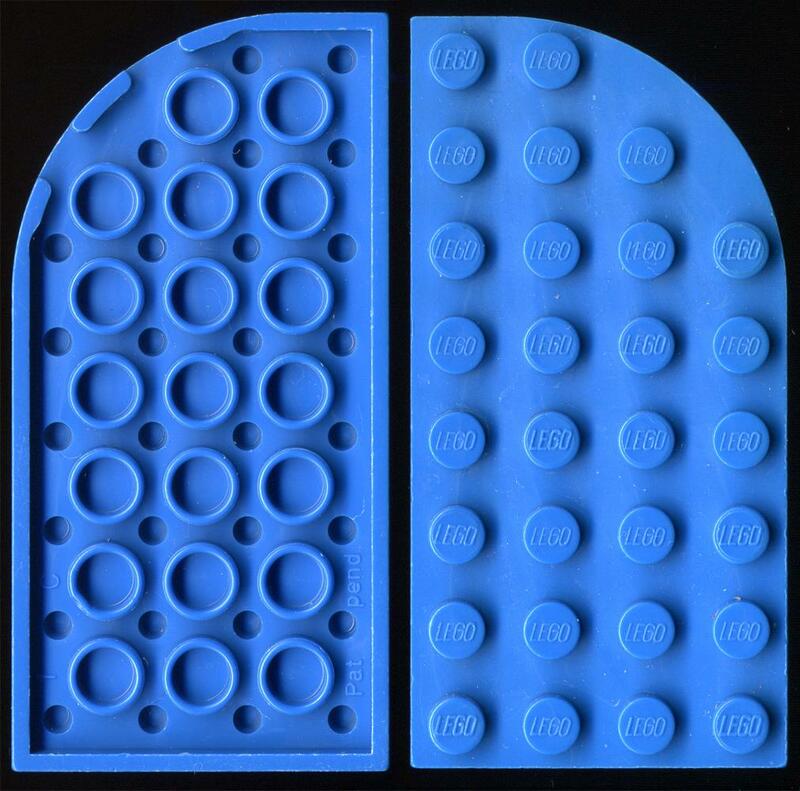 The waffle bottom plates use up 1/3 more plastic than the later circle bottom plates (a 4x6 plate weighs 12 gr. (waffle) versus 9 gr. (circle bottom)). What happened was TLG started making circle bottom plates in 1962 to save on plastic. 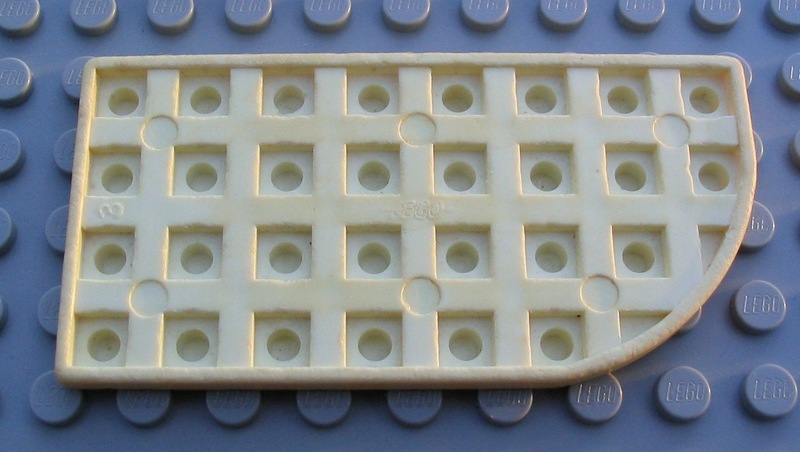 But they still had a lot of usable waffle plate molds left over. So they shipped them to Samsonite (USA/Canada)... where these leftover molds continued to produce the archaic waffle bottom plates until the early 1970s. 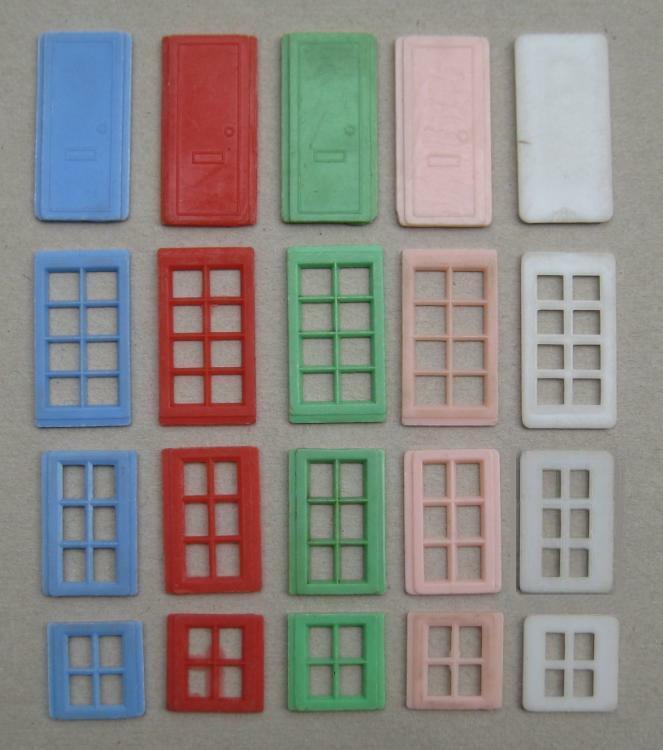 These old plates were NOT made of either Cellulose Acetate nor ABS plastic. They were made of some composite material... and what that material is... is a TLG secret. However, there seems to have been a problem with this material... over time it yellowed very badly. In fact some of these plates are almost orange in color, they are so baldy yellowed. What caused this yellowing? It could have been a MRI (Mold Release Agent), or possibly fire retardant (the culprit for much yellowing today). The weird thing is that I have many very old waffle plates that are yellowed, and others that are still pure (matte) white! 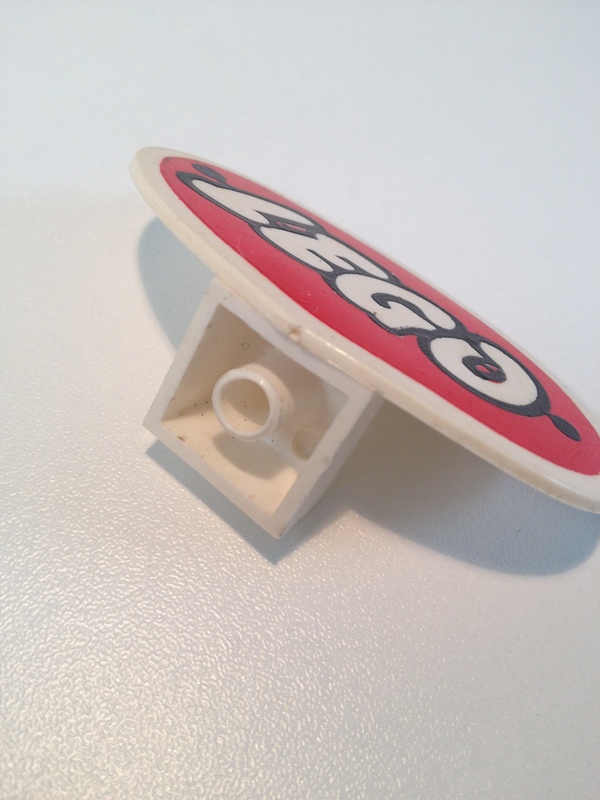 This "composite" material for these old LEGO plates appears to have been used for some time. 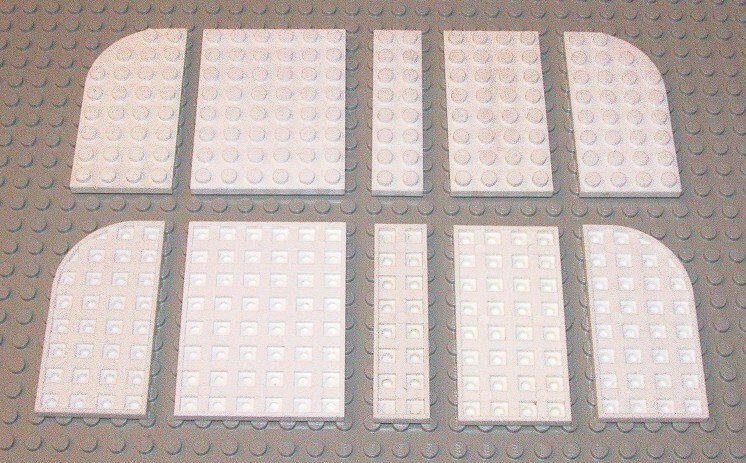 Even though regular ABS plastic plates (shiny) were produced in other colors... the white plates in the 2x8, 4x8, 6x8 and 4x8 curved sizes... they appear to have been made of this composite material in many sizes for some time. 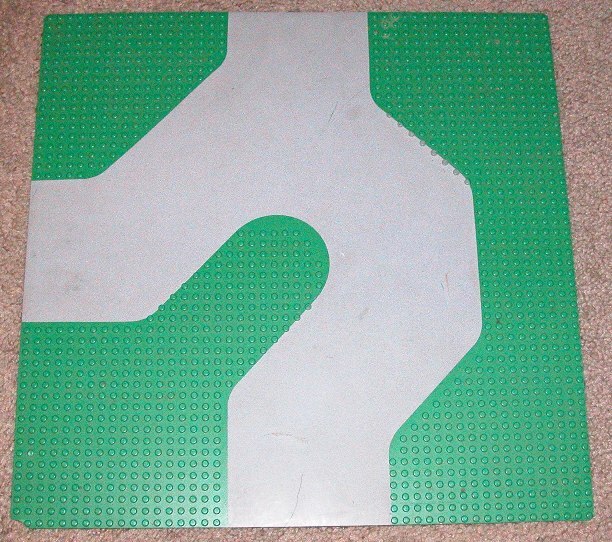 For anyone who has the blue track era LEGO Train System tracks and ties (sleepers)... those 2x8 rail ties are made of this dull white plastic... all the way until 1980 when the track switched to gray/dark gray. 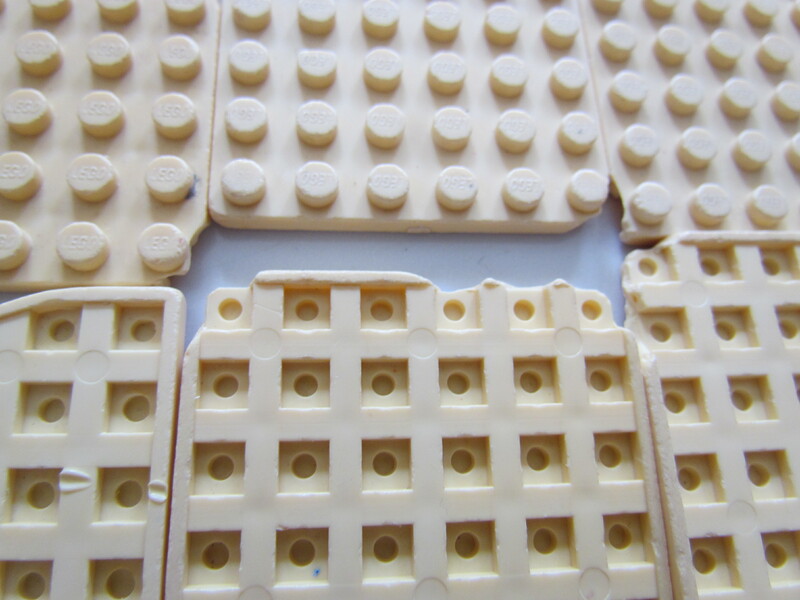 Here are all the 5 sizes of the waffle bottom plates produced. These particular old examples here do not display that excessive yellowing. Why that is, is still a mystery! And here is a close up of the bottom of an earlier 1955-56 waffle bottom plate (no holes within the squares), and the 1956-71 version (with holes). 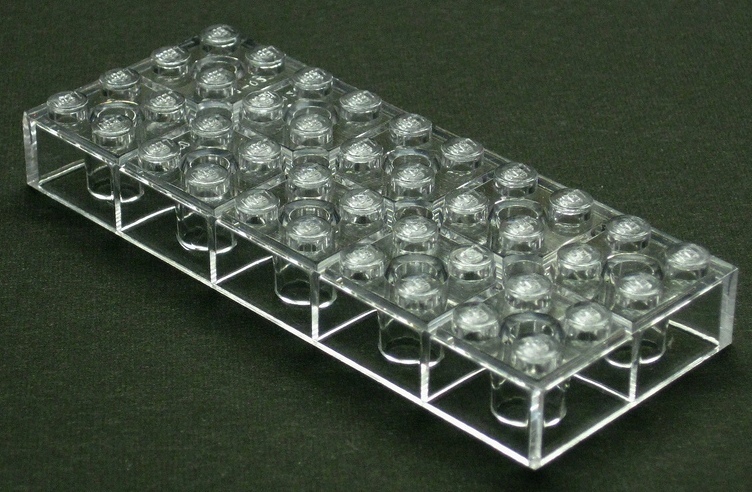 The holes were added because the earlier molds caused problems with the studs on top of the plates fully being injected with plastic. Thanks Istokg, they do seem to be a very different material to the more ordinary bricks. 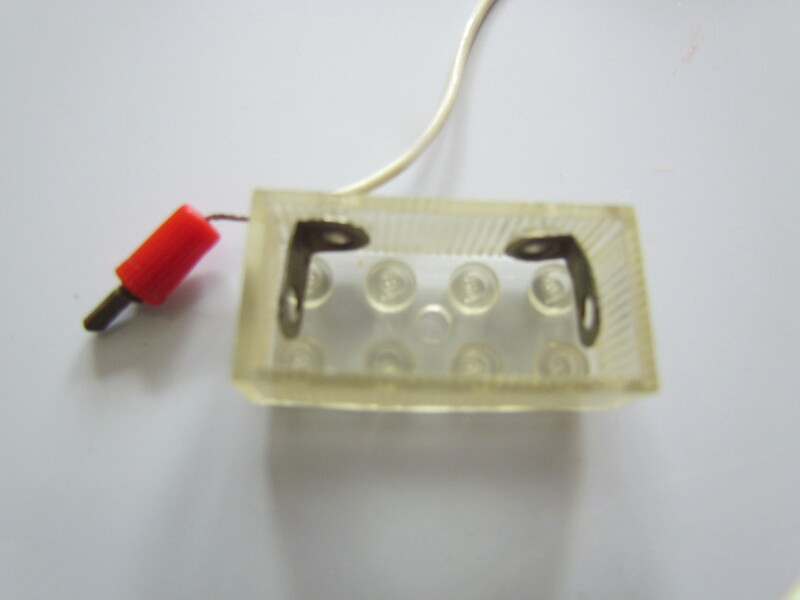 Any idea what the transparent brick with wire is? 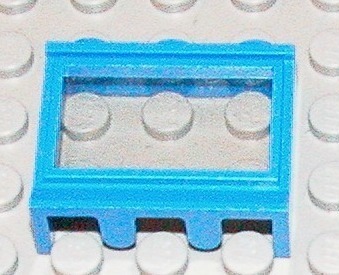 also difference of colour in the trans bricks. Was the silver post an old lamp post - the top is broken! 1) the 1245 or 245 or 445 lighting device set (1957-70). 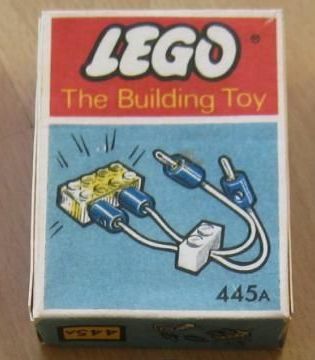 The last one for the UK was the 445A (1969-72) pack with blue cable ends. 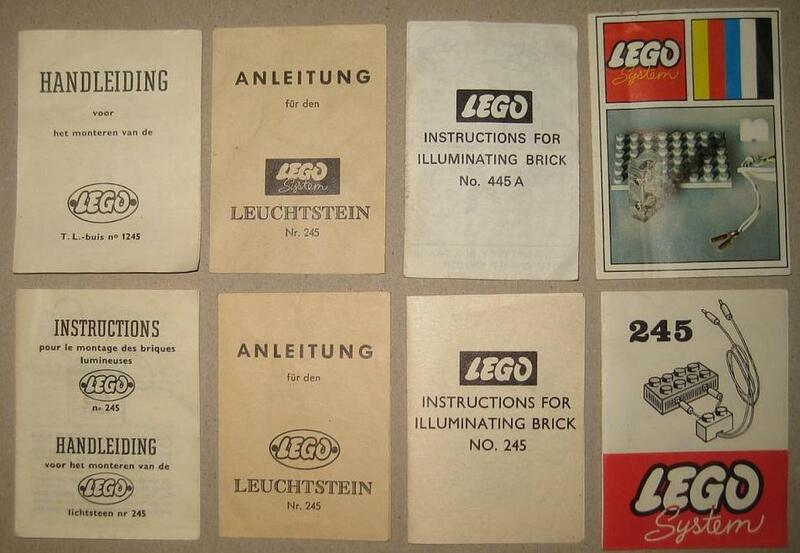 Also the lighting brick instructions brochure thru the years. 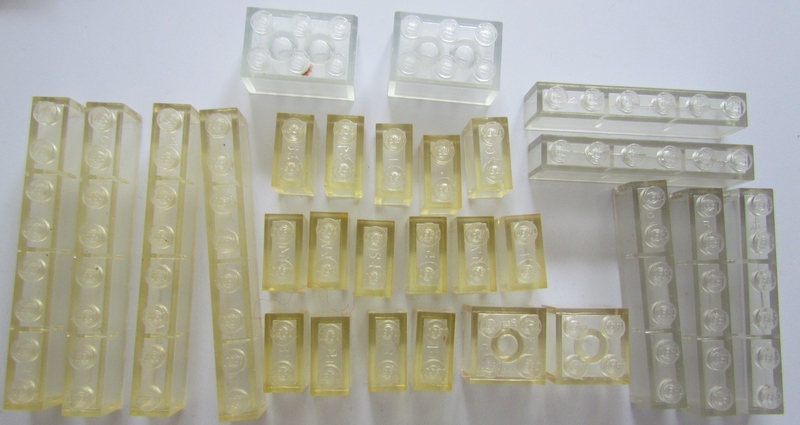 3) the "Champagne" coloured trans-clear bricks are made of Cellulose Acetate (1955-62)... and are often warped (do they wobble when placed on a flat surface?). The more clear bricks are the newer bricks. 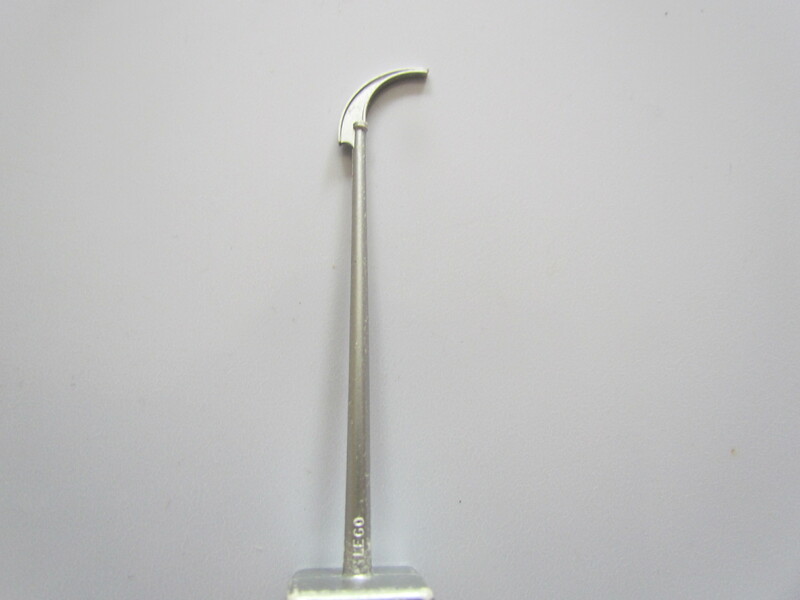 When TLG switched to ABS plastic... that plastic could not be made into trans-clear... so another plastic was introduced... namely polycarbonate. 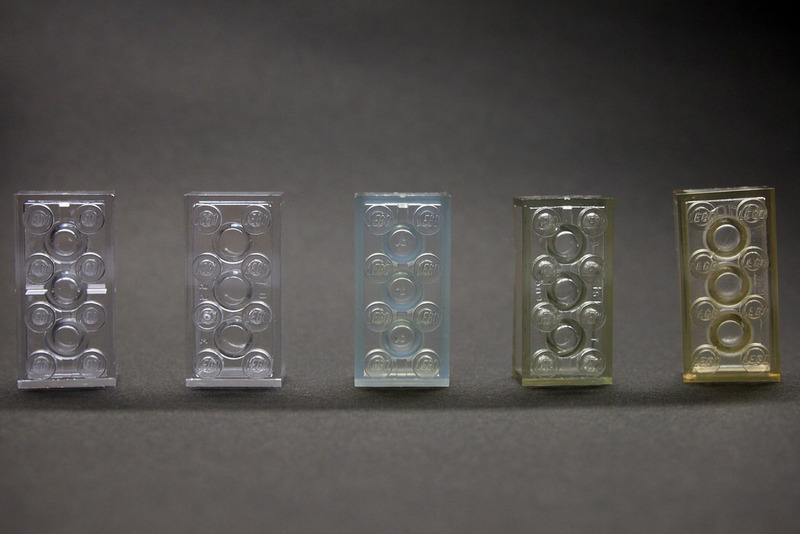 So the clearer looking old bricks are these polycarbonate bricks produced at the same time as ABS bricks were introduced in regular colors. Brilliant, its a shame the lamp post is broken. 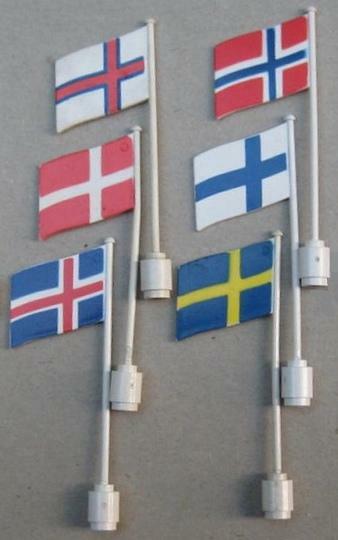 do you remember telling me about the flags on a different post, because I got hubby to glue the (is it Norway) flag back together, and it has the round top, not flat top! Left colum (top to bottom)... Faroe Islands, Denmark, Iceland. Right column.... Norway, Finland, Sweden. 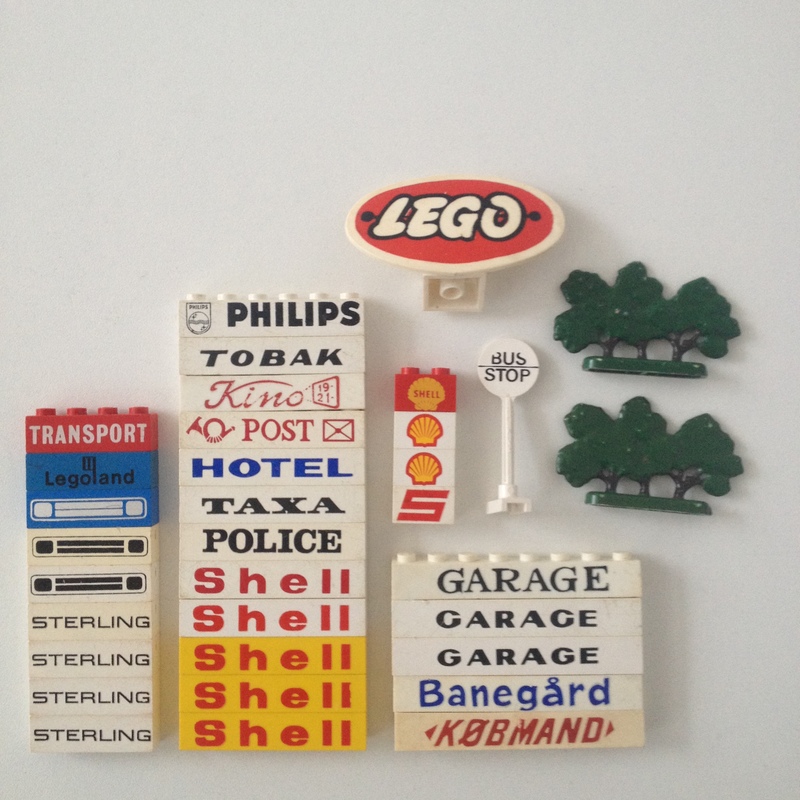 The PHILLIPS, TOBAK, KINO, (large size) GARAGE, BANEGARD and KOBMAND are from a Danish 226 Printed Bricks parts pack, 1958-65 (1st image below shows a sample of the 14 different names that can be found in a 7 brick parts pack). 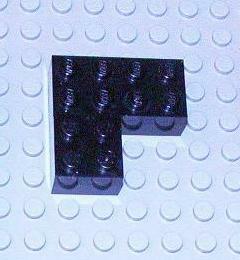 7) the "crown jewel" of this group of parts has to be the LEGO oval. 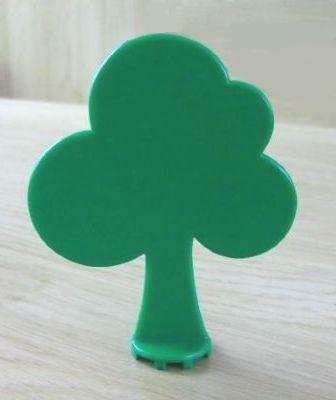 This was never sold in any set... but was part of a glued display model. 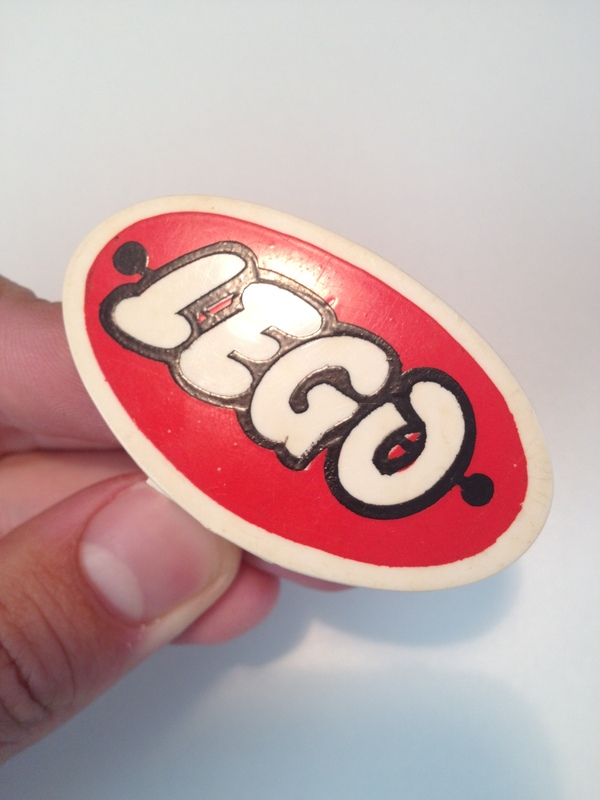 Since it has the LEGO "dogbone" design... it dates to the late 1950s or early 1960s. This is very highly sought after by collectors... and if you were to sell this at auction... you should get a very good price!! 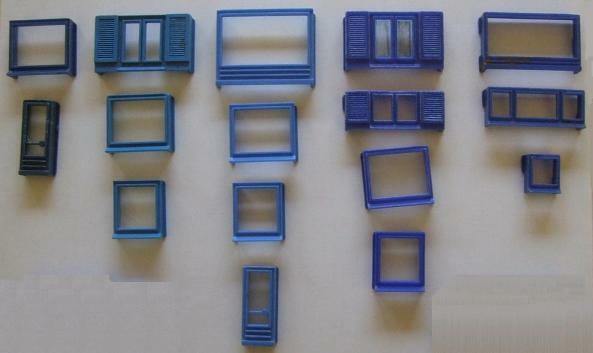 Oppps.... forgot to mention... the previous image (from a UK magazine of 1962) shows several examples of the LEGO oval used with glued display models. 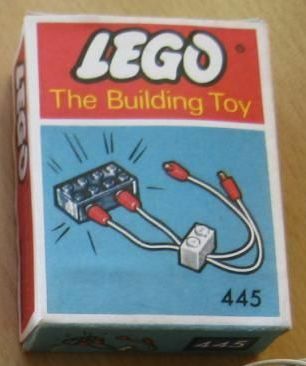 Many of these models were sold to LEGO retailers... 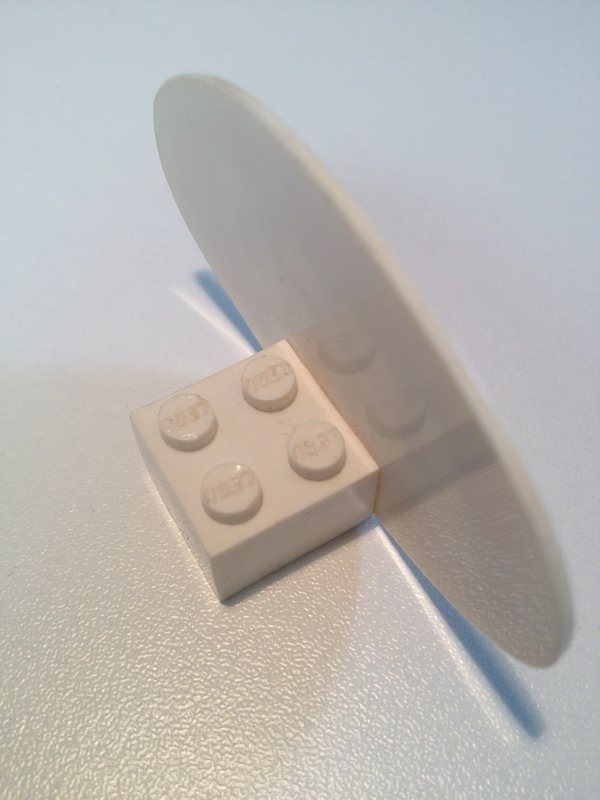 So it is rare enough having a LEGO retailer display model... but even rarer having the surviving oval from one of these... since only a few of these display model designs ever had this oval! Just a quick question, what could the price be for the "Crown Jewel"? & thanks for all the information. 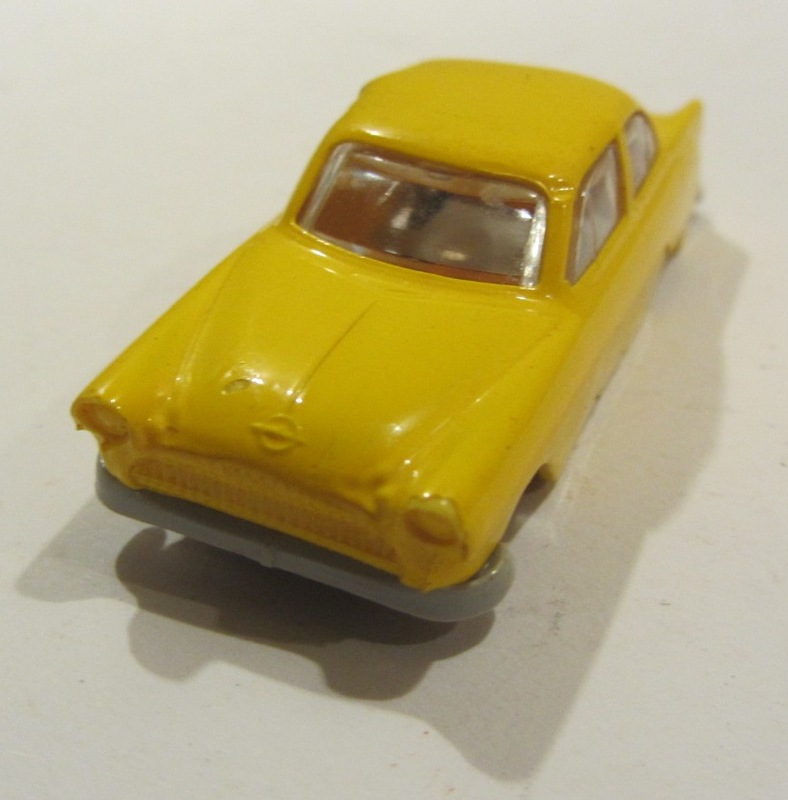 The crown jewel of LEGO parts (aside from those precious metal promotional parts)... would probably be the 1957 LEGO 1:87 cast Opel Kapitän auto. 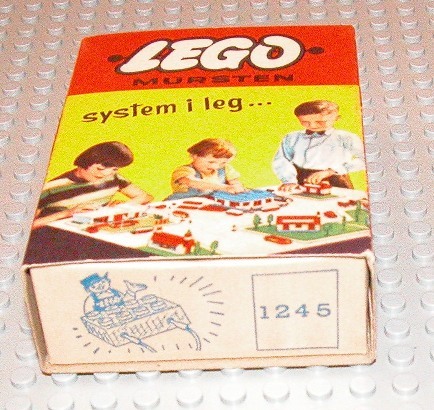 This came out by LEGO Norway in 1957 as a prototype, and never put into production. So far only 9 are known... a few years ago one sold for $4000.... so I would give a great condition example of this rarity a value of about $6000. 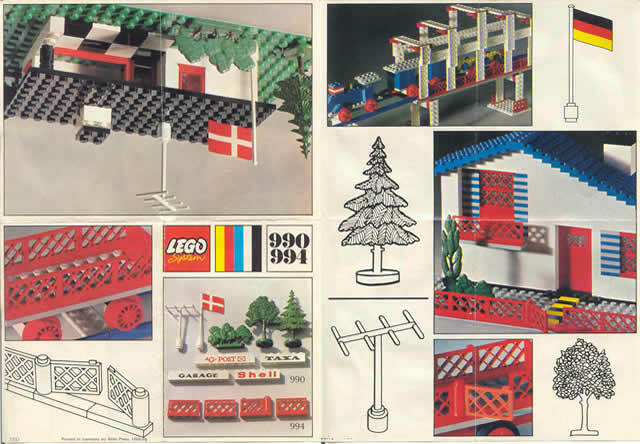 Here are some images of all of the known examples... image from my LEGO Collectors Guide... Chapter 17 - LEGO Prototype Sets/Parts (1955-2014). 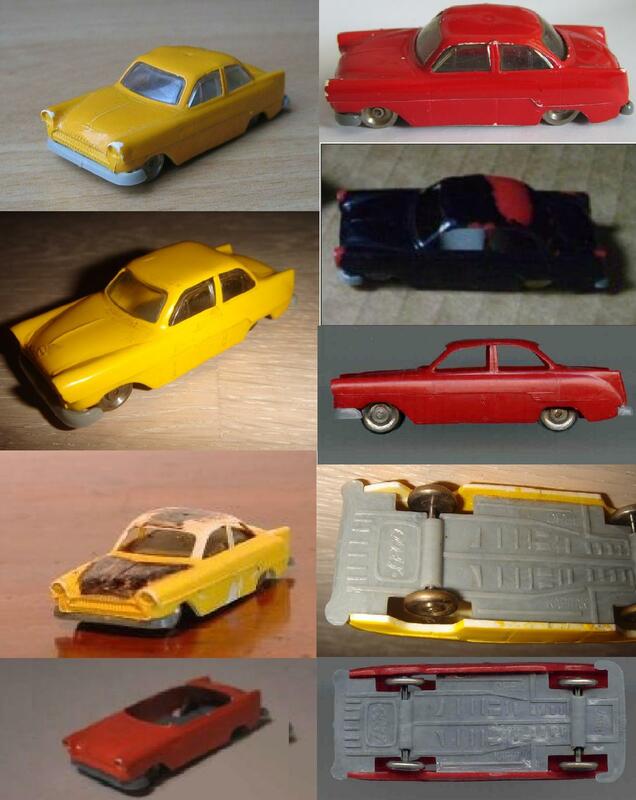 The first image showing the Opel's shows the 7 known examples, many in damaged condition. One very fortunate Norwegian collector sent me images (the yellow and the green cars)... of 2 additional ones that he had found in Norway this year (from 2 different sellers).... a very lucky man!! The green example is without a roof... and it may have been modified by company employees for whatever reason. Although a damaged Opel does affect the value, because of the extreme rarity and uniqueness of the models, the value is not affected as much as one would expect. That's awesome, some sort of fakes must be done by someone? - and that's quite a knowledge that you've got. 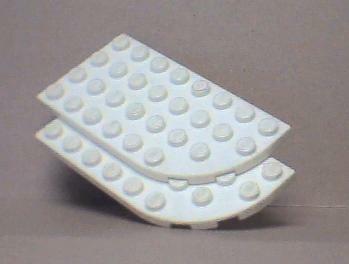 How about the LEGO "Oval" from the "Palace Cinema" in my picture - does it has any price as single piece? and what could it be? Alright, thank you - here's a few pictures of the quality. I would love to have 1949 700/1 (or 700/2 or 700/3). But I don't think that is going to happen. A, I don't think I can afford a $10,000+ Lego set. B, they are simply too rare. LusiferSam.... TLG did something in the early years that I finally figured out.... 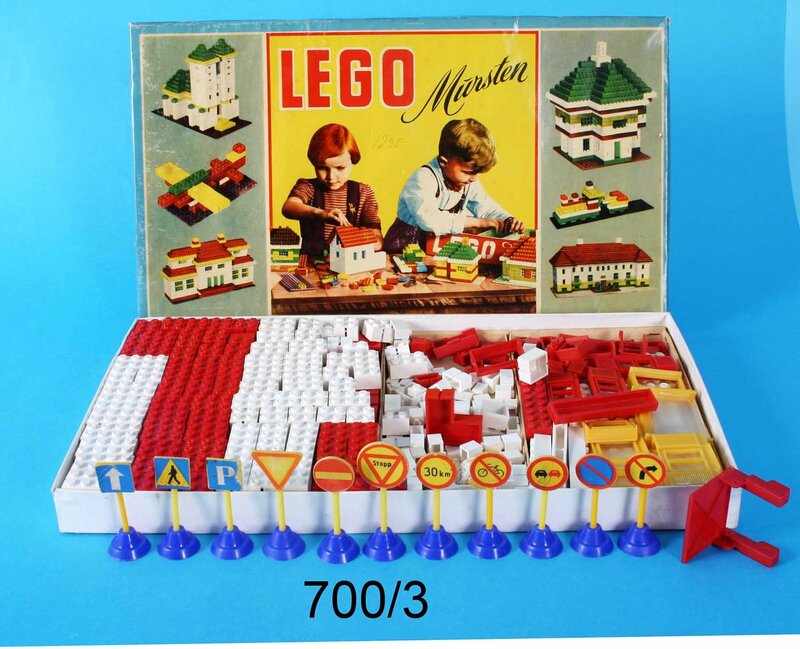 I could NEVER find 3 different box sizes to the 700/1, 700/2 and 700/3 sets. And I finally found out why.... the 700/1 and 700/2 sets SHARED the same box!! 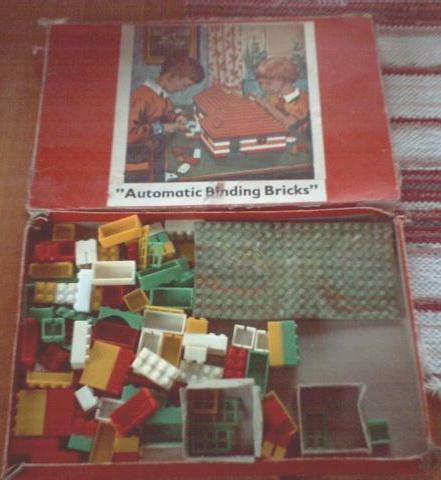 The 700/1 had 84 2x2 and 84 2x4 bricks (and windows/doors).... the 700/2 had 72 2x2 and 72 2x4 bricks.... and used the same box... just not filling the central (overflow) partitions (meant for windows/doors and art cards) with bricks in the 700/2 sets!! So they produced a 700/1 - 700/2 box size.... AND a 700/3 box size. Now I've never seen a 700/3 wooden box.... but this box here is "unaccounted for"... and I bet that this was the very first 700/3 box... out of cardboard! !